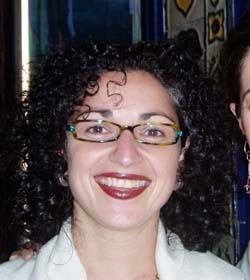 Natalie Zeituny was born in Beirut, Lebanon to an indigenous Jewish Middle Eastern family. In 1975, the year the Lebanese Civil War started, her family fled their home. Natalie lived in Israel for over 20 years, during which she was an honor graduate of the “Technion” Engineering University and a part of an MBA Program at Ben-Gurion University in Beer’sheva. Natalie served in the Israel Defense Forces in the intelligence unit. She is fluent in Arabic, Hebrew, English and some French. Her current endeavor is Conscious Business Transformation- which guides businesses ready to harness their true power to change the world– to become environmentally sustainable, spiritually fulfilling, embrace a humane and socially just set of values in addition to being financially profitable and technologically innovative. Natalie had been working and living in San Francisco since 1998. Natalie previously served as a board member of JIMENA, where she was dedicated to advancing awareness, bridging the gap between the Arab and the Jewish worlds, and providing a more profound understanding about the conflict in the Middle East. As an enthusiastic and dynamic speaker who engages her audience- she also is a service leader at Congregation Shaa’r Zahav in San Francisco.